Our family’s home education journey has taken us to many events over the years. One type of event that has always proved very popular with our boys is Living History. Here in North East England, the Romans, the Vikings, and the English Civil Wars have all played their significant parts in our local history. We have enjoyed some wonderful learning opportunities at Living History days at museums and Roman forts around the North East. We’ve met people dressed in authentic costumes of the era and learned all about the lives of the people they represent. As a parent, I have found this kind of ‘hands on’ approach has really brought the history alive for our boys. For Cee’s Fun Foto Challenge this week on the topic of ‘Events’, I thought I’d share with you a few photos of some of these Living History events. Another thing we have found with the participants on Living History days, is their generosity with their time and knowledge. We talked to this lady for ages about her Viking tablet weaving. It was fascinating to see how the different patterns were made. Our boys took a close interest in how to load a musket at this English Civil War living history event held at the Segedunum Roman Fort, Wallsend in Summer 2010. Later in the same Summer we saw muskets and Civil War artillery in action at the re-enactment of the Battle of Hylton Castle. Sunderland’s Hylton Castle was the scene of this important English Civil War battle in March 1664. The rivalry between the North East cities of Newcastle and Sunderland is legendary, especially in terms of football. Back in 1644, things were no different! Newcastle supported the Royalists and Sunderland were on the side of the Parliamentarians. The Parliamentarians really needed to win the Battle of Hylton Castle to keep the port of Sunderland out of Royalist hands. The Parliamentarians did win which meant the port of Sunderland was also able to continue to supply their allies, the Scottish Covenanters, which in turn meant that the Scottish Covenanters were properly supplied for the pivotal Battle of Marston Moor on 2nd July 1644 – the largest battle ever to take place on English soil. This large-scale re-enactment was organised by the Sealed Knot re-enactment group and a very dramatic battle it was too, with musketeers, pikemen and field artillery. The armies marched to the beat of their drums. The smell of gun smoke filled the air as the musketeers lined up and fired off their muskets and the field cannons were loaded. “Have a care!” they called out, before,”Boom!” the cannons were fired off too. The sturdy pikemen in their steel helmets clashed pikes in noisy groups on the battle field. The ‘injured’ were tended by the female camp followers. As well as the battle re-enactment itself, there was also a large living history encampment with demonstrations of food, entertainments and various skills and crafts of the time. We spent the whole day at this event, exploring the living history encampment, watching the dramatic battle and soaking up the atmosphere among the crowds of people who had come along to experience the Battle of Hylton Castle. 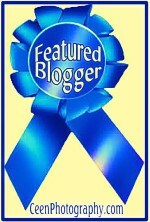 Do take a look at the events others have shared for Cee’s Fun Foto Challenge this week. 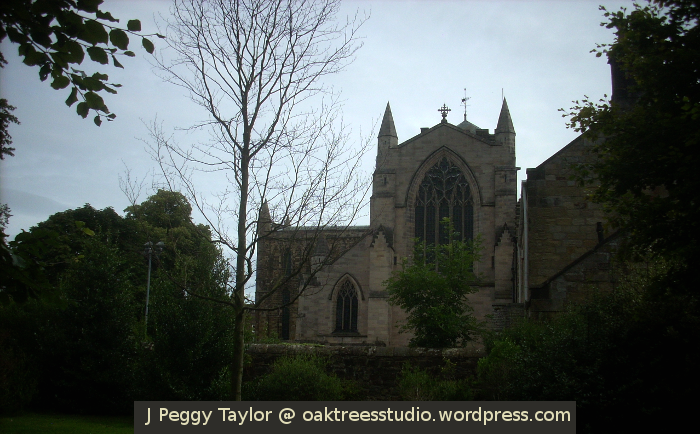 Historic churches are very much part of the fabric of North East England. To find some fine examples for Cee’s Fun Foto Challenge this week on the theme of Churches or other religious buildings, I’ve taken a look through my photo archives. My header image above is of St Mary’s, Gateshead. Much of the current building is Victorian but it retains some medieval features. This church is no longer used for worship and is now Gateshead’s Heritage Centre. Not only does this church building enjoy an impressive view of the River Tyne and the city of Newcastle but it also has the award-winning international music venue, Sage Gateshead as its more recent next-door neighbour. You can’t see it on this photo, but to the right hand side of St Mary’s is Gateshead’s Hilton Hotel. It may be keeping good company nowadays, but back in its medieval history, St Mary’s was the scene of the grisly massacre of William Walcher, Bishop of Durham and his entourage. 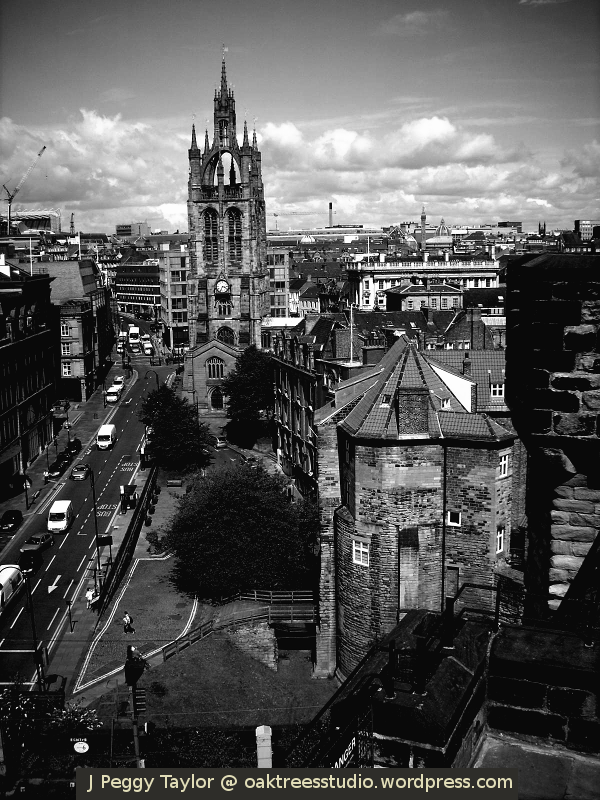 The church and its land was also commandeered by the Scots Covenanters during the Siege of Newcastle in 1644, part of the English Civil Wars. The lantern spire of the Cathedral Church of St Nicholas is one of Newcastle’s famous landmarks. This medieval church building is mainly 14th and 15th century, so it too has seen its share of the historical conflicts that affected North East England. One story tells that during the 1644 Siege of Newcastle, the mayor, Sir John Marley, held the Scots prisoners in the church, right underneath the lantern spire, to deter the Scots army from aiming their cannons at the church from their position across the River Tyne at St Mary’s, Gateshead. Hexham Abbey is the oldest of the churches I have chosen for this challenge, with Wilfred’s original church on this site dating back over 1300 years to the 7th century when Hexham was part of the Saxon Kingdom of Northumbria. The town of Hexham lies only a few miles from Hadrian’s Wall so it is not surprising that the original church was built mainly from stone salvaged from nearby Roman ruins. The Saxon abbey in turn was ruined by Viking invaders in the year 875 and the church was subsequently replaced by an Augustinian Priory around the end of the 12th century. The current building of Hexham Abbey largely dates from the 12th century priory. Only the crypt beneath the abbey was part of the original Saxon building. Please do take a look at the Churches and religious buildings that others have found for Cee’s Fun Foto Challenge this week. Roads form the physical connections between our human settlements – towns, cities, villages or even single houses. Most of us use roads every day as a vital means of communication. In our area, many of our modern roads can trace their history to a web of tracks that took our ancestors from A to B for all their various purposes, from collecting food and fuel to marching to war. I find old maps are a fascinating source of detail on the places visited by people in the past and the roads that took them there. We can often see how busier routes developed and others fell into disuse as settlements changed according to the needs of their inhabitants or sometimes due to other external factors. 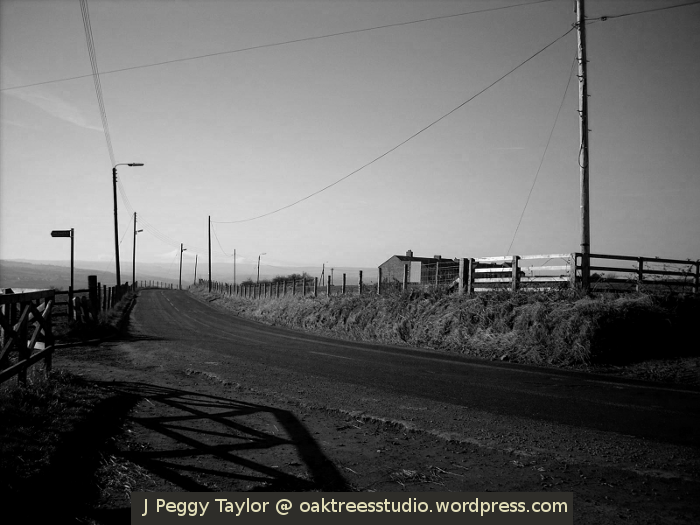 The road in my header image climbs to the top of the hill from our village as it connects our valley to the Tyne valley to the north. In Summer we like to walk up here to admire the view from the hilltop. On a clear day we can see as far north as the Scottish border and a good few miles south too, across the North Pennines. As quite a busy route, this road has gradually been resurfaced and widened over the years. Originally, around 400 years ago, this section of the road would have been a track leading from the village squire’s grand hall up to an adjoining hilltop road that linked to other significant properties nearby. 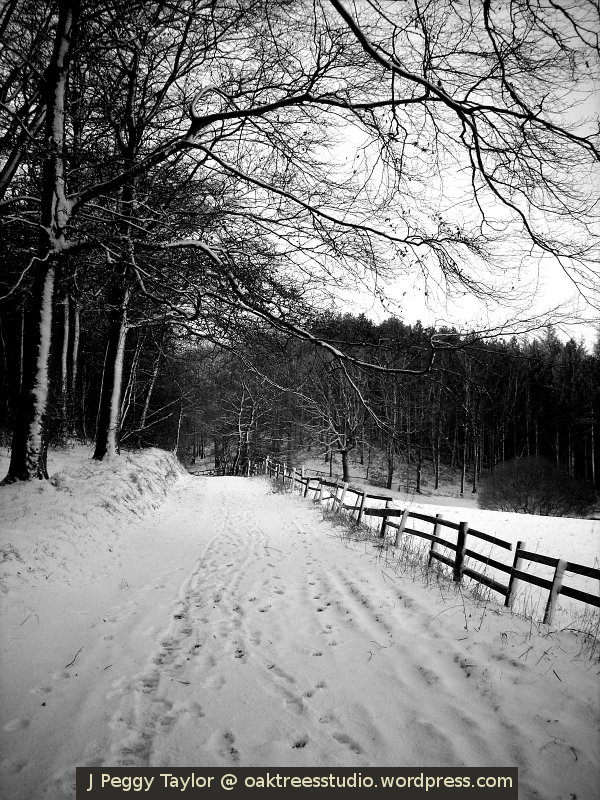 It may be snowy but the old road through our woods is always a very popular route. This single track road used to be the main road that linked our village to other villages nearby and it is still well-used for this purpose though it is no longer the main road traffic route. 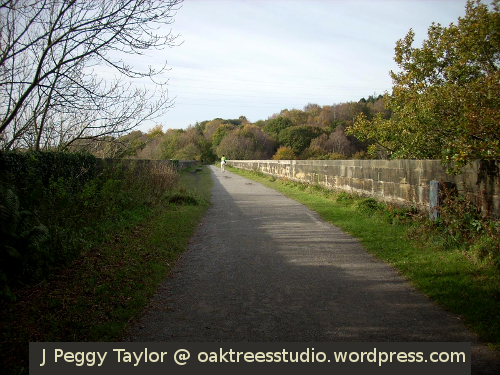 Its route travels over the Victorian railway bridge that I’ve written about previously. In 2002 the road was closed to road traffic and adopted by the Forestry Commision. To preserve the old stone bridge, use of the road is now restricted to walkers, cyclists and horse riders, with vehicles being restricted to essential access only. The main road into our village drops down from the north east, twisting and turning as it goes. Here is one of those turns as the road suddenly lurches rightwards along the valley side. Driving towards our village along this road, it is at this point the whole vista of the valley comes suddenly into view. Impressive cloudscapes, Winter sunsets or just many layers of grey in a classic demonstration of aerial perspective draw the eye south westwards through the river valley. 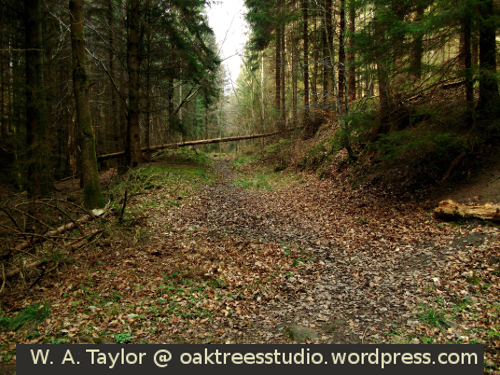 This photograph is taken from the ‘end’ of the old road through the woods that I showed you above. The route heading right in this image links the two adjacent villages and developed into a main route sometime in the late 19th century – the same time as coal mining became a prominent industry in the area which created increased transport needs in itself as well as via an increased population. 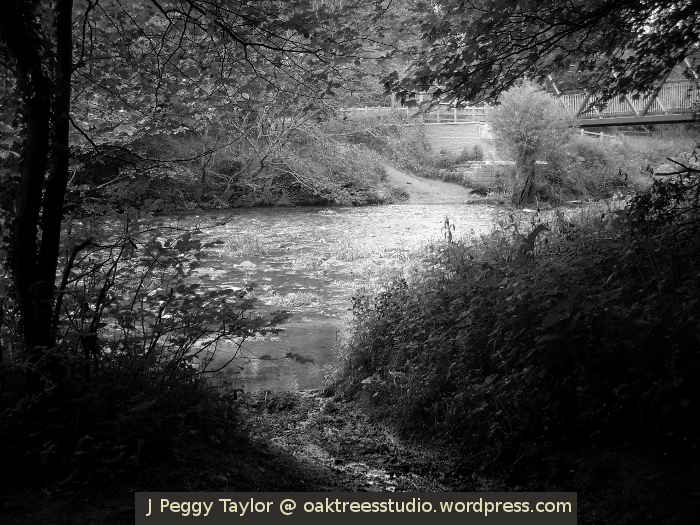 This river ford is part of another interesting old road in our valley. 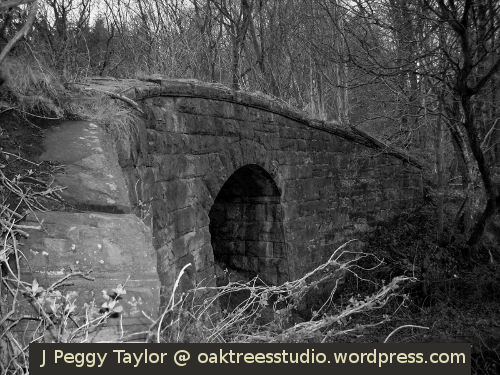 The old road that crosses the River Derwent here is known as Clockburn Lonnen – lonnen is a local dialect word for ‘lane’. In the past this lane formed part of the main route from the cathedral city of Durham to Scotland and I believe it probably originally dates back into pre-Roman times. From the Norman Conquest of England in 1066 through to the English Civil Wars in the mid-1600s, war and conflict between England and Scotland feature regularly in our local history here in North East England. As a main thoroughfare in those days, Oliver Cromwell’s baggage train, complete with heavy guns drawn by teams of oxen, travelled via Clockburn Lonnen and the Derwent ford on the way to the Battle of Dunbar in the September of 1650. This old road must have been rather wider then than we see it now in the foreground of this photograph. 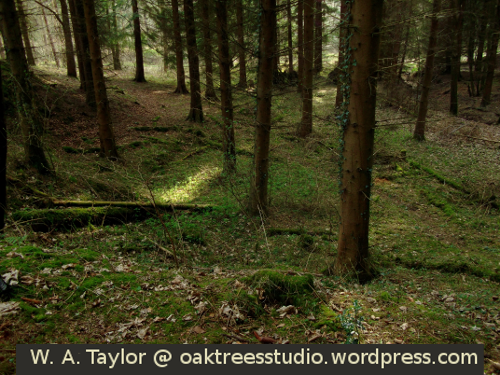 In my final photograph the scene changes from countryside to coast. We often visit this part of the North East coast during the Summer months and enjoy the picturesque walk along the clifftops overlooking the sea. The National Trust now take care of this section of coastline with its fascinating limestone rock formations and the Souter Lighthouse. When our walk is done we make out way out onto the coast road here, halfway between South Shields and Sunderland, and wait for the bus to take us back into the town centre. I hope you have enjoyed roaming along with me and taking in some of our favourite roadscapes. 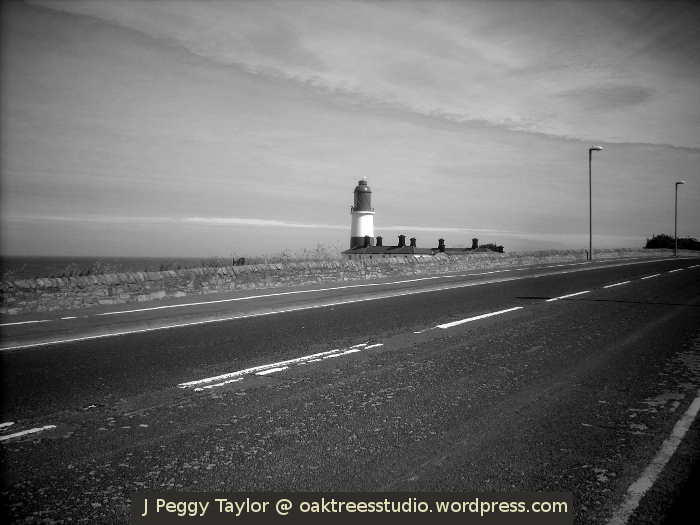 Do take a look at Cee’s Black and White Photo Challenge for more roadscapes this week. Whenever I look out across our green and wooded valley it seems hard to believe that around a century ago it was a major coal mining area with pits in every village and an extensive network of railways with steam trains carrying tons of coal every day to the staithes on the River Tyne. This industrial heritage has left us the legacy of miles and miles of old railway paths, many of which have now been ‘upcycled’ into trails for walking, cycling and horse riding. 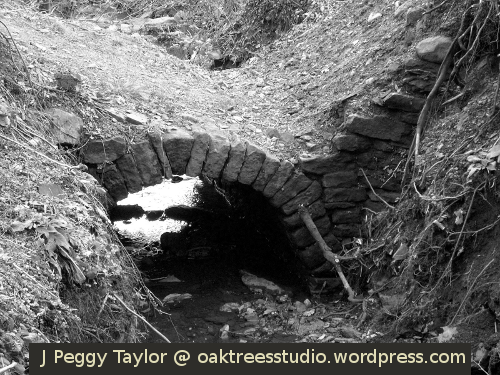 As Cee’s Fun Foto Challenge this week is “Ground:rocks, sand, dirt, paths, walks, trails”, I thought I share some photos of some of our local old rail trails. 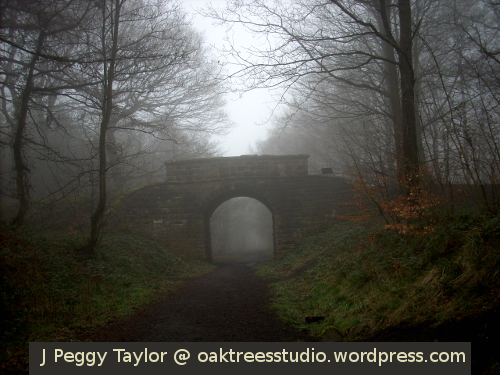 The old railway path and railway bridge in the woods where we often walk. 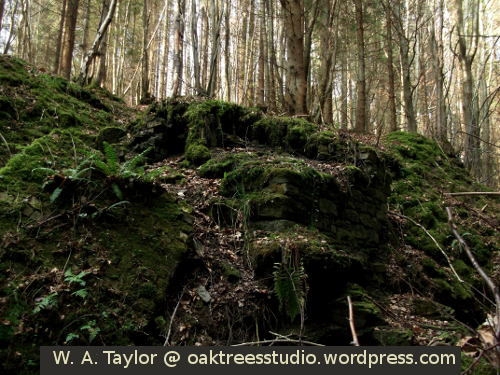 This railway was a mineral line carrying coal from local mines. I think in this misty shot it looks like something from a Victorian mystery story! Some of our local railway paths form part of a particularly popular long distance cycle route, enjoyed by 15,000 people every year. It’s called the C2C, and it is celebrating its 20th anniversary this weekend. The route travels 79 miles right across Northern England, literally from sea to sea, hence the trail’s name! I can’t say I’ve ever covered the whole distance, though we have walked several sections of it at different times. 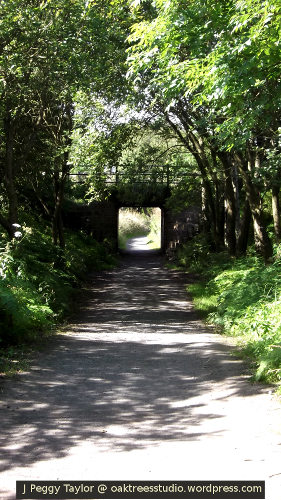 The Derwent Walk Railway Path forms part of the C2C cycle route through Gateshead. 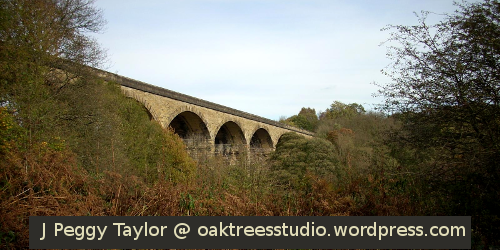 This 9 arched viaduct was built to carry the railway over the River Derwent. 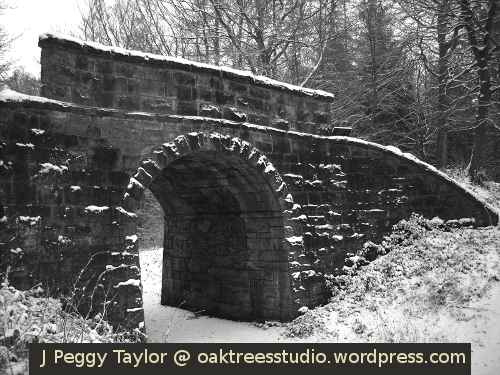 Built originally in 1867, the Derwent Valley Line carried goods and passengers. 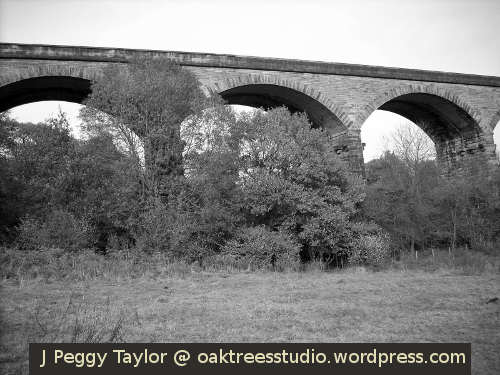 The Nine Arches viaduct that carried the Derwent Valley Railway. The C2C cycle route follows the Derwent Valley Railway Path through this part of Gateshead’s countryside. The Waskerley Way is an old railway path in County Durham that forms part of the C2C cycle route. The Stanhope and Tyne Railway was also a mineral line but this one carried limestone for use in the local iron and steel industry. Whilst I was looking for my challenge photos for this week I also came across one I took whilst out with my youngest son recently. This one involves a muddy trail and a muddy tale! 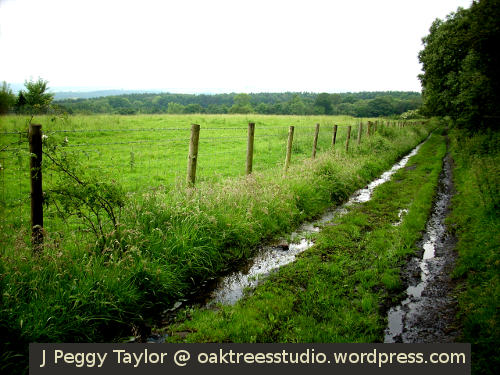 Our walk took us along one of our favourite muddy paths where we spotted a trail of deer tracks in the squelchy mud. We observed from the tracks that the deer had been running in the same direction as we were walking but though the tracks were quite fresh there was no other sign of the roe deer that had left them. 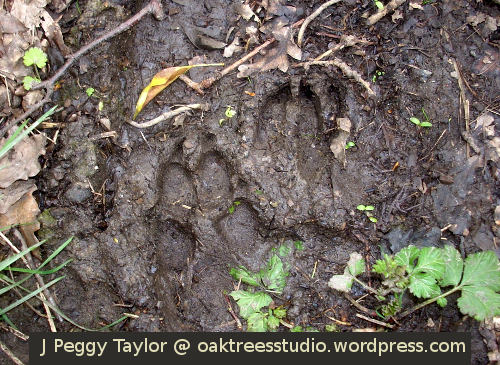 Tracks in the mud – is it a bear chasing a deer? 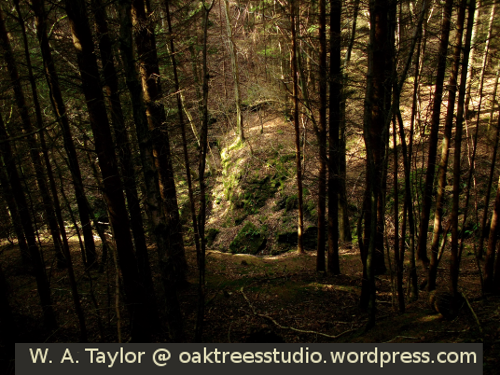 The arrival of Springtime sunshine started something of a creative cascade for me. I described this creative wave in an earlier post and this has combined with the additional seasonal inspiration of Nature waking from her winter slumber and showering us with new shoots and blooms from the warming earth. 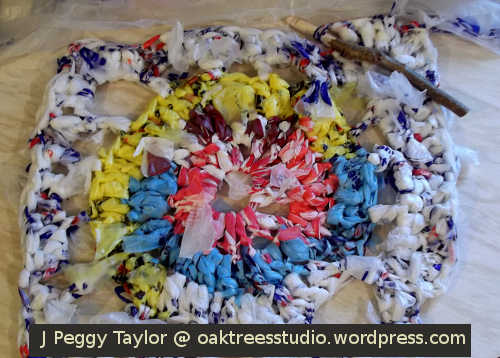 One of the projects that has so far evolved from my kinetic Springtime spree of creativity has been my upcycled supermarket carrier bag rug. In my last rug update post I was interpreting my design as a mirror of how we make use of the world’s finite resources – a message in my mat. As I crocheted further on my mat I began working on the white section. It is not pure white, as you can see, but is laced with red and blue. Sometimes these colours are clearly seen, sometimes masked. The mat’s message here is the influence our one small country, Britain, has had on industrialisation both here in the UK and throughout the world, particularly since the period of time we call The Industrial Revolution (during the 18th and 19th centuries). This influence has left its legacies everywhere. Like the red and blue colours, sometimes these legacies are very evident and sometimes they are masked by more recent developments. 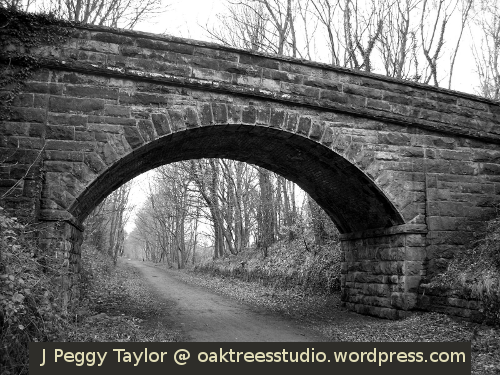 This Victorian railway bridge spans a path where we often walk. 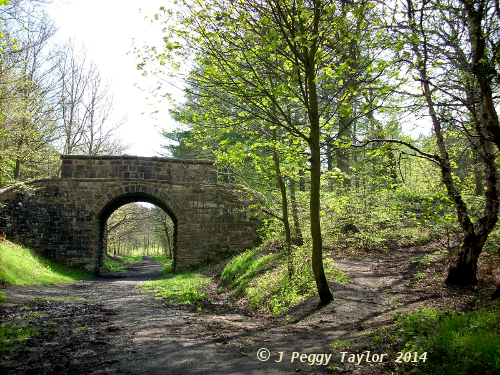 The path was once a mineral line, busy with steam trains hauling coal to the River Tyne. North East England, where I live, was renowned for the coal production that powered the Industrial Revolution. Our local environment is full of remnants of this industrial past. The very house and village in which I live was built for mine-workers. In creating my mat here I feel this represents a link between the past and the future. Just as mining families would have created their old rag mats that I talked about in my first post on this project, I too am now crafting my mat from upcycled materials. It is important to me to try harder to use less of the earth’s resources – though I do not claim to be perfect by any means! Most of us accept that fossil fuels, such as coal and oil, are not good news for our planet’s future. I think we can all try and play our part by reducing our own consumption and carbon footprint and by encouraging each other in our environmentally-aware endeavours. There is so much we can do ourselves but also by spreading our ‘encouragement’ in the direction of our governments we can try and use our collective powers of persuasion to convince them that our one and only planet is certainly worth caring about. To reflect in my mat these feelings of hopefulness and of actively encouraging environmental awareness, I chose to finish it with a strong green border. You may notice the border is deeper on two sides. These deeper sides will eventually lie east to west in my porch. This final part of my message mat is to say that from east to west, around the world, we can all play our part in protecting our planet. I’ve enjoyed creating my upcycled message mat – both the crochet part and thinking about the story that belongs to this mat. On a practical level, I’m happy with the way my mat has worked out. It is nice and thick and is quite soft too. 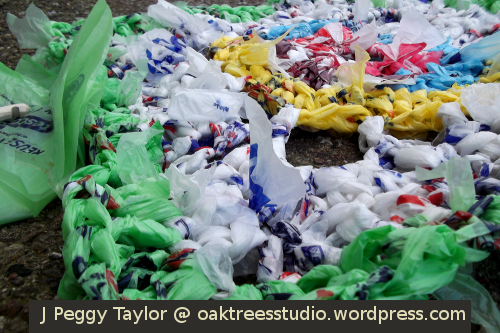 The construction method I chose involved simply knotting each strip of carrier bag to the next. I realised this was obviously going to leave a lot of loose ends but rather than try and hide them all, I thought they resembled carpet pile so I decided to leave them showing. I think they add to the texture of the finished mat too. I am also glad to say the mat fits just nicely in its intended destination, my front porch. I am working on a new upcycling project this week. There’s nothing especially notable about that in itself as upcycling is a concept I have been crazy about forever … so that’s a long time before the word ‘upcycling’ was even first coined! 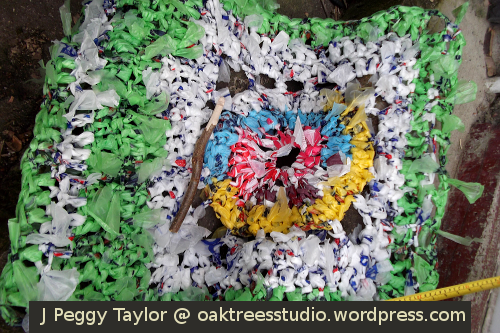 I love the positive notion of upcycling and its environmentally friendly connotations. However, this particular upcycling project emerged from a curious mixture of inspirations that happened to me within a fairly short time-frame of just a few days. These ideas tumbled together in my head like a ripple effect – each individual source of inspiration built on and fed into the others. The result felt like a huge wave that rolled on with the tide until eventually it crashed, sending a series of rivulets rushing up onto a calm sandy beach. As on a beach when each rivulet carries with it a new mixture of pebbles, shells and ocean detritus, so each of my rivulets of creativity carried with it its own collection of creative nuggets. Each rivulet is now a germ of a whole new idea. What was in my wave of inspirations? I’ve been reading a book recently about an historical form of upcycling in my local region. 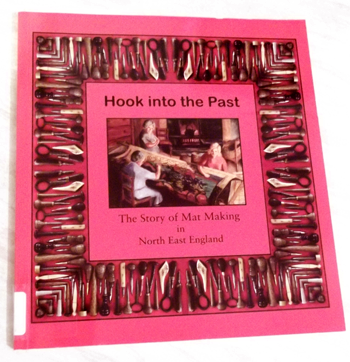 The book is called “Hook into the Past: The Story of Mat Making in North East England” edited by Ellen Phethean. The book describes the craft of making rugs, locally known as ‘mats’, from pieces of old clothing and textiles that had reached the end of their useful lives. The ‘mats’ were made mostly by working-class people to put down on the floors of their homes as shop-bought carpets were largely unaffordable. Families and neighbours worked together to make the mats. These ‘hooky’ or ‘proggy’ mats were essential household items for North East working people right up to the middle of the twentieth century. I follow certain tags on WordPress. One of them is “creativity”. I find it produces a serendipitous array of creative ideas that I can then filter through my personal ‘creativity fishing net’. Some ideas will become my ‘big fish’ whilst others might just prove to be useful ‘shrimps’. I find there’s always a good range of ideas on offer to satisfy my creative hunger. 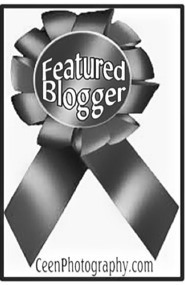 On a recent trawl through the “creativity” of bloggers on WordPress a couple of posts particularly caught my eye. 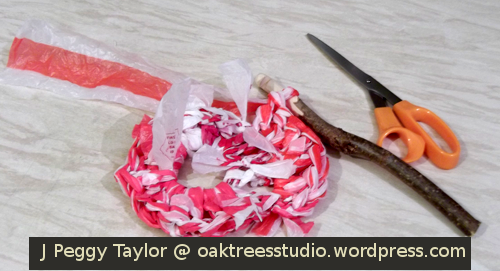 The first was entitled “Polyethylene macrame” and showed a colourful image of plastic shopping bags knotted together by their handles – which I learned is something of an art form in Beirut’s supermarkets. 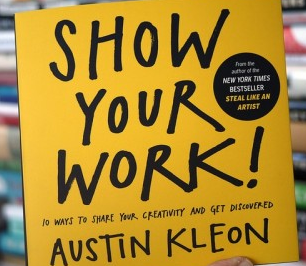 Austin Kleon’s new book, Show Your Work! 3. Spring … and cleaning! Some of my regular readers will know I am excited about the imminent arrival of Spring and have been avidly seeking signs that we are progressing towards it. One of the less exciting aspects of the changing season for me is the lovely Spring sun shining on those forgotten dusty household corners revealing the need for prompt clearing out and cleaning when I would much rather be outside checking on Nature’s progress! … but that will be another story.